So many have done it so many times. Yet, I have always wanted to get one that I had in mind. Yes, I am talking about the famous flare shot in namma Marina. I had a particular shot that I had tried in vain for a long time. This time around got fortunate with 80% closeness to the image in mind. Shot through the fire of the corn roasting process, I used two godox lights for this. 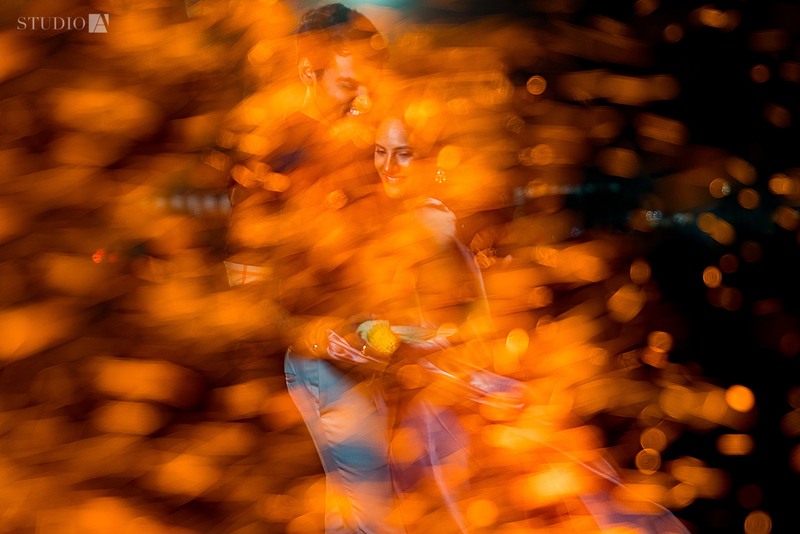 One Godox Speedlight with a MagMod yellow gel to separate the couple from the background and one godox Speedlight on an SMDV softbox to light their faces exclusively. There was also a street light at the far back which I included faintly to separate the groom’s head from the background. For a change, we waited for the Sunlight to go down. Then we shot this. After many shots that we tried, I got lucky with this one that had the couple’s faces visible through the flare.